Trinity Bellwoods Park is a public park located in the west end of Toronto, Ontario, Canada, bordered by Queen Street West on the south and Dundas Street on the north. The western boundary of the park is Crawford Street, several hundred feet before Crawford intersects with Dundas St. West, the park juts toward Shaw Street, westside of the Crawford Street Bridge. Most of the park's area lies in the original Garrison Creek ravine and this creek, now a buried city storm sewer, still flows beneath the park from the northwest to the southeast corners. The old Garrison Creek emptied into Lake Ontario at the site of Fort York, and the land north and west of the fort was set aside as a military reserve. 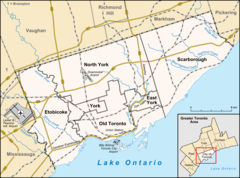 As the town of York grew around the fort, the military reserve was gradually sold off in lots to retiring British officers and friends of the military command. British Army Lieutenant-Colonel Samuel Smith is said to have bought 1,000 acres (4.0 km2) of land here in 1801, which he called Gore Vale after Lieutenant Governor Francis Gore, the Vale in the name referring to Garrison Creek ravine. Much of the current park land was originally purchased from a Janet Cameron (sister of Duncan Camerson whom first lived here) of Gore Vale in 1851 by Scottish-Canadian Bishop John Strachan, an influential Anglican deacon who wanted Toronto to have a private school with strong Anglican ties, partly in opposition to the recently secularized University of Toronto. Buildings were soon constructed (Gothic Revival structure by architect Kivas Tully) and students began attending Trinity College in 1852. After federation with the University of Toronto in 1904 and completion of the downtown Trinity campus in 1925, the school left this location. The original buildings were then sold to the City of Toronto and most were demolished in the early 1950s. The destruction of the Trinity buildings marked the beginning of two decades of extensive heritage destruction in Toronto. Of the college itself, only the stone and iron gates now remain, at the Queen Street park entrance facing south on Strachan Avenue, although the former St. Hilda's College building from 1899, (the women's residence of Trinity College) still overlooks the northern half of the park on the western edge. It is now a seniors' residence, John Gibson House. In the 1950s, Garrison Creek was entirely buried and the creek ravine backfilled around the Crawford Street Bridge, raising the surface of the northern end of the park to almost the height of Dundas Street. The steep drop from this upper level to the lower part of the park has become a popular local toboggan run in winter. The larger southern part of the 'bowl' is the largest designated dogs 'off leash' park. Picnic tables are also provided here for summertime use and public washroom facilities. There is a historical plaque the commemorates the bridge buried under this stretch of Crawford, just south of Dundas West. The park is 14.6 hectares (36 acres). It has a community recreation centre, managed and owned by the City of Toronto, called Trinity CRC, located at 155 Crawford Street on the west side of the park. It has two indoor pools, gymnasium, fitness centre, indoor walking/running track and multi-purpose rooms. Adjacent to the centre, in the park, are a volleyball court, large playground, and children's outdoor wading pool. Also in the park are eight outdoor tennis courts located in the south-east corner and an outdoor ice skating rink at the north-east boundary and volleyball court just north of the Rec Centre. There is also field space for soccer, football, and rugby, as well as three softball fields along the east boundary. Toronto Parks, Forestry and Recreation Division maintain a marked Discovery Walk and shared pedestrian/cycling trail above and parallel to Garrison Creek, which runs through the park from the northwest to the southeast. Trinity Bellwoods is a favourite place for local residents to walk their dogs. The ravine, known as the dog bowl, is the designated leash-free area. Since around 2009 the park is a destination for many (young adults, families, hipsters) to hang, picnic, consume beverages and generally meet up in all sizes of groups. You'll see card playing, croquet, slacklining, bocci ball, pickle ball, board games, musicians. On a nice summer day the park can literally have about 4000 folk enjoying urban nature. The park is home to white squirrels, the subject of urban folklore in the city. The Toronto Special news magazine featured White Squirrel hunts in a past issue. The true albino squirrels have pink eyes. It is deemed good luck to have spotted one, or two. As there are families of them. The diverse variety of native and imported trees planted throughout the park, in various stages of growth from young to mature, provide a brilliant display of fall colour against the deep green grass. The Friends of Trinity Bellwoods Park run the volunteer Adopt-a-tree program (originated by the Friends) that helps insure the survival of newly planted trees. The emerald ash borer beetle is slowly infesting the trees and succession planting and Parks, Forestry and Recreation have been aggressively planting every year to replace the many that are designated to be cut down because of this beetle. In winter the night view of the Toronto skyline rising above the ravine is extraordinarily beautiful, especially looking east from the Discovery Walk pathway near the western boundary. Tall black Victorian-style iron lamp poles along the main paths provide safe but soft illumination and a charming touch of character. Trinity Bellwoods has been the site of many recent cultural events, including outdoor movie nights, an anarchist book fair, live theatre, performance art, and informal summer drumming circles. In June 2007 a weekly farmers' market opened in the northwest corner of the park, at Shaw and Dundas. In the northwest corner of the park there is a small reminder of the diverse Latin American character of other nearby neighbourhoods: a bust of Simón Bolívar which was donated to the city. This is where the Trinity Bellwoods Farmers' Market is located. It was originally chosen as the site of the G20 protests on June 26–27, 2010, but Toronto Police announced that they would use the area north of Queen's Park instead after local residents opposed the use of Trinity Bellwoods Park as a protest site. Queen West Art Crawl is an annual art sale in September in and around Trinity Bellwoods Park. The alleys and lane ways which surround Trinity Bellwoods park have become an impromptu art gallery open to the public for one weekend in September for the past four years. The event is dedicated to support artist in Toronto (particularly artist in Queen West). Treble Charger wrote a song called Trinity Bellwoods, which was on their debut album NC17. The 1998 film Dog Park was shot there. The 2010 film Scott Pilgrim vs. the World had a scene filmed here. Toronto-based artist organization Humble Empire created the "Live In Bellwoods" series of videos featuring acoustic performances by popular artists living in or visiting Toronto. Each video highlights a different area of the park. Dave Monks from Tokyo Police Club, Luke Lalonde from Born Ruffians, and Chris White of Bellewoods were among the performers to be featured in the series. Wikimedia Commons has media related to Trinity Bellwoods Park. ^ "Parks, Forestry and Recreation : Trinity Bellwoods Park". Toronto.ca. Retrieved November 1, 2016. ^ "Toronto Parks: Trinity Bellwoods Park". Blogto.com. July 24, 2012. Retrieved November 1, 2016. ^ "Police chief reconfirms that Queen's Park will be designated protest area during G20". CP24.com. May 11, 2010. Retrieved November 1, 2016. ^ "QWAC". qwac. Retrieved November 26, 2018.